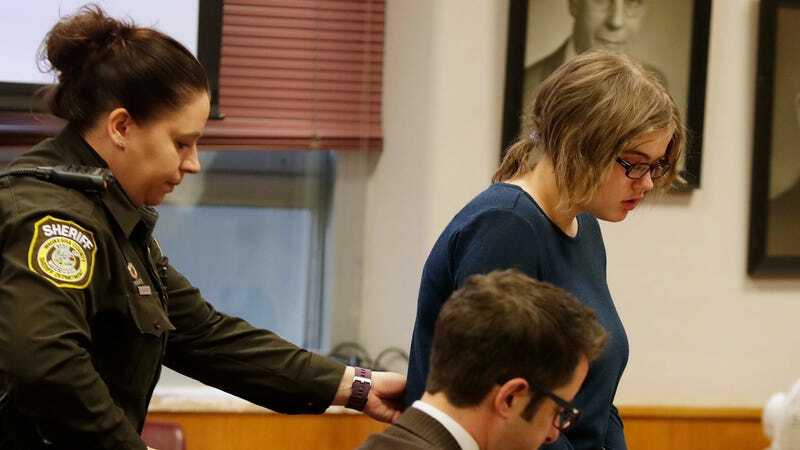 Morgan Geyser, one of the two teens accused of stabbing classmate Payton Leutner at the behest of “Slender Man,” a fictional phenomenon created by the internet, has been sentenced to 40 years in a mental institution in lieu of jail time. Geyser’s sentence came after a day of expert testimony about the teen’s psychological progress. The Chicago Tribune reports that attorneys argued that her schizophrenia and psychotic spectrum disorder made her susceptible to delusions and paranoia. But the three doctors that argued in her defense said that she was no longer exhibiting psychotic symptoms and would fare best in a mental facility that allows for her to socialize with other teenagers. Until now, Geyser has been in a mental institution comprised mostly of adults and is the youngest person there. Part of Geyser’s plea agreement, which she accepted in October, was that a judge found her not guilty by reason of a mental disease or defect. This means that the harshest sentence she could’ve received was the one she got and she successfully avoided any criminal charges. Geyser and a friend, Anissa Weir, were 12 years old when they lured their classmate into a park in Waukesha, Wisconsin, stabbing her 19 times in an attempt to appease the “Slender Man,” a faceless internet monster often referenced on websites/horror forums such as Creepypasta.